The low mass of Skutt thermocouples ensures that changes in temperature are measured quickly making it one of the most responsive thermocouples on the market. It should be noted that the thermocouple of this unit is different from other models. It is bent downward to provide more room in the firing chamber. The 8" x 8" x 6" interior size and 2250 degree max temperature makes this perfect for glass, PMC, enameling, and even ceramic jewelry. The Cone Fire Mode runs preprogrammed firing schedules that were designed to optimally fire ceramics at the speed, cone number and hold time you input. This mode lets the operator design their own firing schedule with up to 8 segments. A segment includes: a rate, a temperature and a hold time. It will even hold in permanent memory up to 6 of your most frequently used programs. After entering a program in either mode the controller will ask you if you want to input a specific temperature for an Alarm to sound. You can always fire slower but if you need to go fast this kiln reaches Glass Fusing temperatures in less than 20 minutes. 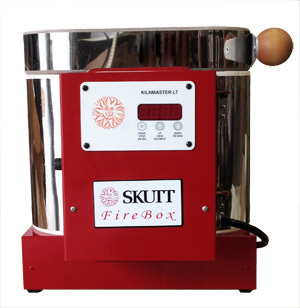 The easy to read digital pyrometer allows you to know exactly what temperature the kiln is. 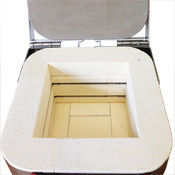 Unlike other kilns of its size, the GM Firebox 8 x 6 LT digtial has a hinged lid so you do not have to worry about where to put the hot lid when you want to work inside the kiln. 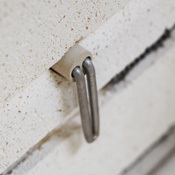 The lid opens over 90 degrees so it is out of your way when loading or working inside the kiln. The kiln is buckled to the base of the kiln so it can't slip off.